What can be more inspiring than cruising on a 34 feet beautiful yacht, the ultimate offshore fishing machine! This is what we pictured ourselves in mind as we got into yacht sales project for a boat brokerage company. The challenge was to build a scalable fully featured CRM system incorporating customer management, business operation tools and client portals for an army of boat brokers fighting for the best deal of the day. Working hand to hand with the business owner, a young ambitious yacht aficionado, we have been building a unique product of its kind adding more and more features to the basic idea on the go. As a result, we created a flexible, fully customizable system satisfying the needs of all parties involved: business owner, administration staff, purchase and sales brokers and their multiple clients. 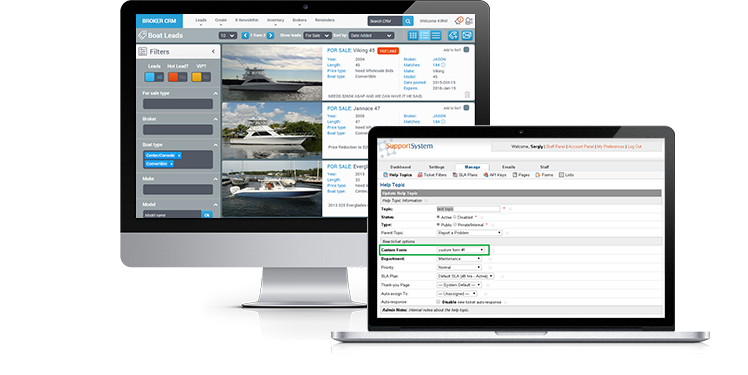 The system simplifies customer service processes and can handle a variety of new features such as facilitating boat brokers’ tasks who deal with buying and selling, dividing customers according to their roles and access rights, tracking the process of selling and buying boats and a lot more. Now, we are proud of what we have done. All aboard! Full speed ahead!